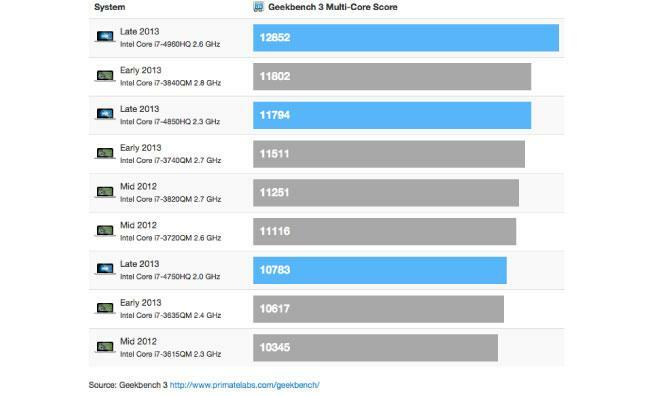 The team behind popular benchmarking suite Geekbench has rounded up the scores for Apple's newest Retina MacBook Pro models and finds that despite slower processor clock speeds across the board, the Haswell-powered laptops outperform their predecessors by as much as 8 percent. Single-core performance for the 13-inch variants is up only two to four percent over the previous generation, which John Poole, founder of Geekbench parent Primate Labs attributes to the new revision's focus on power efficiency rather than speed gains. The 15-inch variant sees much larger leaps in performance in its high-end configuration —the newest 2.6-gigahertz flagship jumps eight percent in both the single and multi-core benchmarks over its 2.8 gigahertz predecessor, for example. Mid and low-end variants gain a more pedestrian two to four percent. Interestingly, the latest high-end 13-inch MacBook Air trails the new 13-inch MacBook Pro by only five percent in the single-core benchmark, though the gap widens to thirteen percent in the multi-core benchmark. "Users with applications that only use one core won't notice much difference between the Air and the Pro," Poole writes. That does not extend to the laptops' battery life, however, as the MacBook Air still bests the new MacBook Pro by three hours in that category. Poole calls the performance increases from the more conservatively-clocked Haswell processors "interesting," but notes that the processors are not always running at the advertised speeds. Thanks to Intel's Turbo Boost feature, the clock speeds can be increased as needed to handle more demanding workloads —the 2.3-gigahertz Haswell chip in the newest MacBook Pro can boost up to 3.5 gigahertz, for example. The Geekbench scores, which began trickling in on Wednesday, are based on processor and memory performance. GPU performance is not included, and as a result we have yet to see what effect the inclusion of Intel's Iris Pro graphics chip has on the Retina MacBook Pro's capabilities.